Yoshi has always been my favourite character in the Mario franchise—for the record, the list goes Yoshi, Luigi, Bowser, Rosalina, and Geno—for, who not but Yoshi, is responsible for the very existence of Super Mario, at least canonically. And just as Yoshi has always been my favourite Mario character, so too has Super Mario World 2: Yoshi’s Island always been my favourite Mario game. Yoshi has had several outings, both in escorting babies to their parents and adventuring to protect his island from the scheming of Kamek and Baby Bowser. While all games have maintained a similar gameplay style, they’ve all managed to be unique, creative; and above all: fun. However, Yoshi’s Crafted World lands somewhere in the middle of these core concepts, maintaining what makes these game’s great, but failing to build on them in any meaningful way. 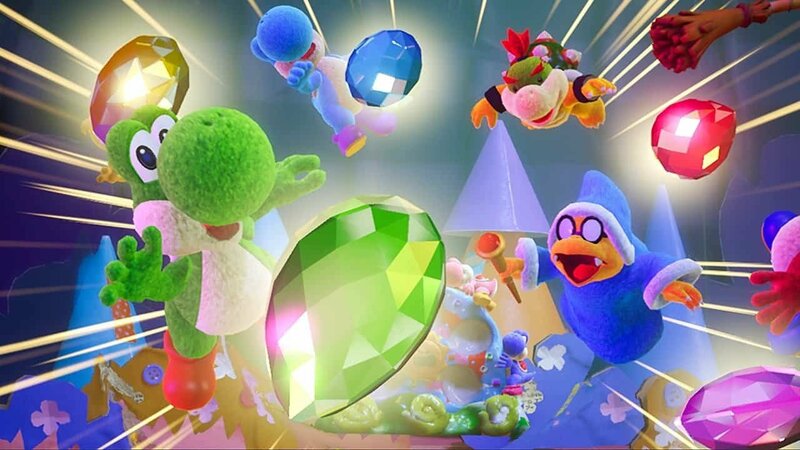 Yoshi’s Crafted World begins with the Yoshis enjoying a pleasant day on Yoshi’s Island, dancing around the Sundream Stone—a gem-set stone that is said to possess the power to make anyone’s dreams come true. However, when Kamek and Baby Bowser learn of this stone, they attempt to steal it, causing the Sundream Stone to scatter the gems across the world. From there, the Yoshis set off to recover the stones before Kamek and Baby Bowser can claim them for themselves. It’s a simple enough plot that provides Yoshi with an impetus for setting off on his quest and provides the necessary minimal context to justify the new and creative world. However, and this may just be a nit-pick, I can’t help myself wanting something a bit different. Much like many of the other Yoshi games, the plot is nothing more than: “Baby Bowser take thing, Yoshis get back,” and there’s only so many times you can recycle the same plot before you start getting diminishing returns, even for a Yoshi game. But realistically, the plot is only so much garnish for the main course: the gameplay. 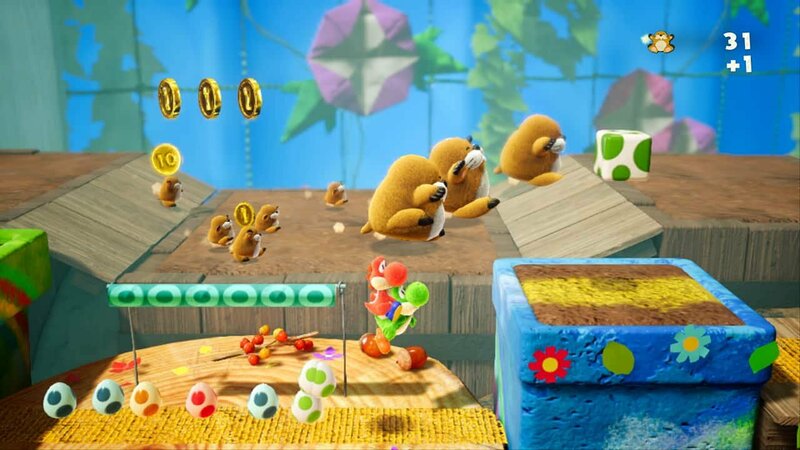 Like it’s predecessors, Yoshi’s Crafted World has Yoshi moving through 2D levels, gobbling up enemies, turning them into eggs, and throwing those eggs at any obstacle. Like previous games, there is a light puzzle-solving element to each level as both finding ways to progress, as well as hidden flowers and red coins require either hitting the right object or a well-timed toss. New to the franchise is how Yoshi’s Crafted World changes the way eggs are thrown. In previous entries, when players would ready an egg, the trajectory crosshair would appear—swinging up and down like a pendulum until the player released the egg at their desired position. While this made egg-throwing a bit complex, it also allowed for Yoshi to be able to move, while aiming in a two-dimensional space. In Crafted World, when players ready an egg, Yoshi now stays planted but players have full control of the crosshairs, allowing for more precise aiming. While this adds a lot to the control players have in aiming eggs, and plays into the games new mechanic of aiming at both the foreground and background; it reduces the freedom of movement while aiming from previous games, making egg throwing a slower, more methodical process. And that, for me, is my biggest issue with Yoshi’s Crafted World. The whole game feels a lot slower and less interesting. Don’t get me wrong, I have no problem with a game being a more relaxed experience—no one needs to “git gud” at a Yoshi game—but I just never felt this game grabbing me the same way Good-Feel’s Woolly World, or even Kirby’s Epic Yarn did; and every time I started playing, I felt the urge to play something else fairly quick. This lack of hook is something I felt in the game’s visual conceit as well. 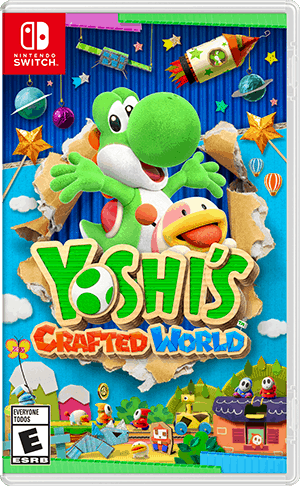 Like it’s predecessor, Crafted World plays with the idea that the entire world is made of arts-and-crafts supplies. 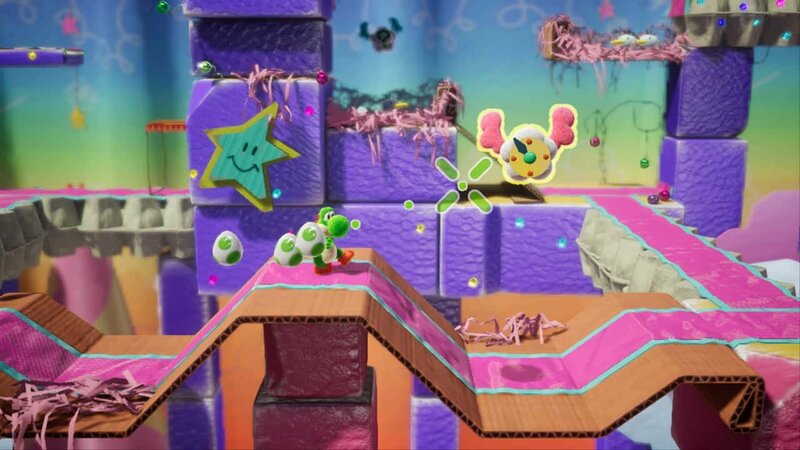 Much of the world itself is made of cardboard, many background details like rivers and trees are made from construction paper and household objects, and Yoshi and several of the enemies have a plush-toy look. Visually, the game is absolutely beautiful, using a lot of colours and genuine creativity to make some really amazing looking levels. However, unlike its predecessor, it never really does much with the whole visual conceit. Aside from a handful of moments, you’re never constructing things out of cardboard or using the crafting supplies to build things to help you through levels. It just feels like a real missed opportunity to integrate the visual themes into the gameplay—the way Woolly World, or even Epic Yarn really did. But where Crafted World really missed the mark is in the music. 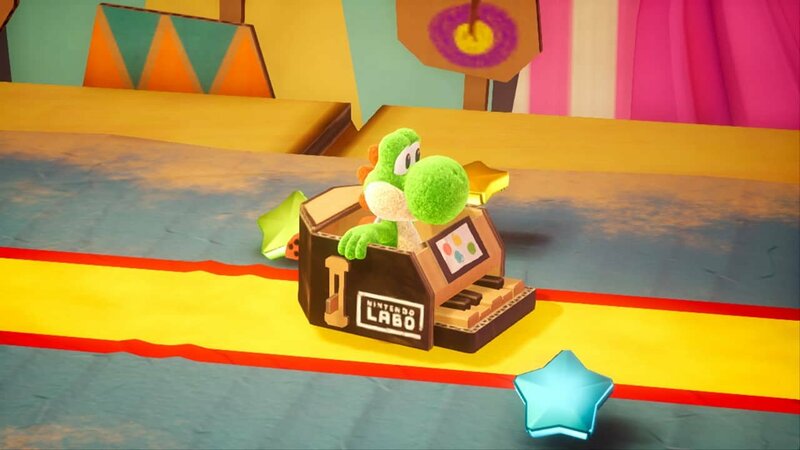 Any player, such as myself, who enjoyed the multitude of amazing tracks from Woolly World is going to be genuinely disappointed with Crafted World, as every level simply either re-uses the same “main theme,” or remixes it in a pretty simple way. While the music is not really bad, it just gets tiring hearing the same track repeated over and over in every single level. Crafted World is definitely a more bite-sized experience which plays well to the Switch’s portability. Most levels are relatively small, taking only 10-15 minutes to complete, if players are looking to get all the flowers and red coins. This definitely works for the Switch as players can pretty easily hop in-and-out of a level or two during commutes or lunch-breaks.